What you are looking for in any given moment often has a lot to do with where you find yourself. When out an about in the hustle and bustle of the city, a quick mobile search for an open-late sub shop carries very different meaning than that same search completed from a desktop computer 100 miles away from that city. One search is seeking details about the types of options available–the other is looking for a sandwich. Both of these searches are valuable in their own way if they will lead a new customer to your doors, but the same information isn’t going to satisfy both. That is where mobile sites come into play. Mobile sites are streamlined versions of your existing website that are tailored to smartphone and tablet use. These websites lack much of the bells and whistles that are such an integral aspect of standard websites, like flash plug-ins and large images, but in eliminating these aspects mobile sites add a degree of practicality and usability that is so essential to mobile search. A good mobile website outlines the who, what, when and where of a situation. It tells the person conducting the search where they are going, when your business is open and who or what they can expect when they get there. By knowing how to use this type of mobile search to your advantage you can increase your internet marketing reach and open your doors to an entire new audience. Separate it. There are many companies that have chosen to keep their full website intact for mobile devices, but this isn’t ideal in most situations. Specially designed mobile sites are popular for a reason. 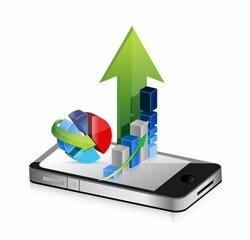 Mobile sites provide the user with what need to know in an easy to navigate format that is simple. In most situations, a full website is difficult to navigate on a mobile device. Brand it. While your mobile site should be different from your standard site your logo, color theme and general branding should not be. You will want your mobile site to be easily identifiable as yours, even if you are swapping out a fancy rotating banner for a simple menu with large text. Locate it. Incorporate geo-locating services into your mobile app as much as possible. Where your potential customers are means a great deal to your business, and the type of information they are seeking will likely change based on your location. Many mobile websites use GPS driven features to improve the usability on the go. A good mobile site can significantly improve your business and help you reach an entire new audience who are using their mobile devices to search the web. By creating a smartly designed mobile website you can expand your internet marketing reach without making any changes to your existing online platform.